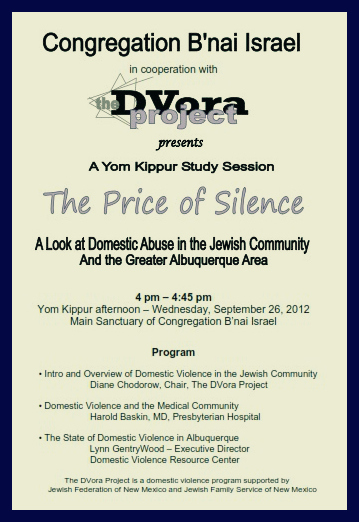 The DVora (דְבוֹרָה) Project, a program of the Jewish Federation of of New Mexico and Jewish Family Service of New Mexico, was created in 2002. As a Jewish voice in the fight against domestic violence, it seeks to raise awareness about the devastation that domestic abuse can inflict upon our lives, our children and our community. The DVora Project reaches out to both the Jewish and non-Jewish community, providing educational programs for teens to seniors . DVora also partners with domestic violence service providers to provide food, teddy bears, toys and necessities for victims of abuse and their children. It also collaborates with government agencies and the clergy, working to make New Mexico a safer place for us all to live.